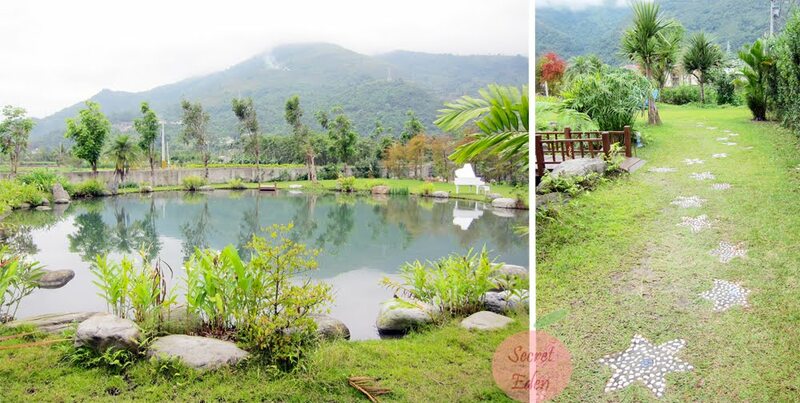 I seriously recommend staying at B&B in Taiwan when visiting, cause they are so much more interesting than hotels. 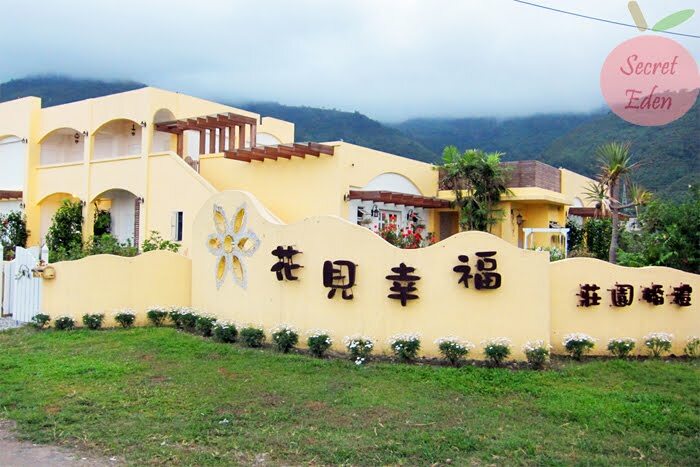 When R and I were visiting Hualien, we stay at another beautiful B&B called Flower Happiness B&B. I know I know, the name does sounds funny, but trust me it's sounds much more beautiful in Chinese. Unfortunately on the day we arrived, the weather was crappy, or else the picture would turn out much nicer. Anyways, one of the owner came to pick us up from the train station. When we were reserving, he did mention a $100NT cost for the pick up, but that was actually never charged. There room was very cute and homey. Of course, the theme was flower, given the name of the place. 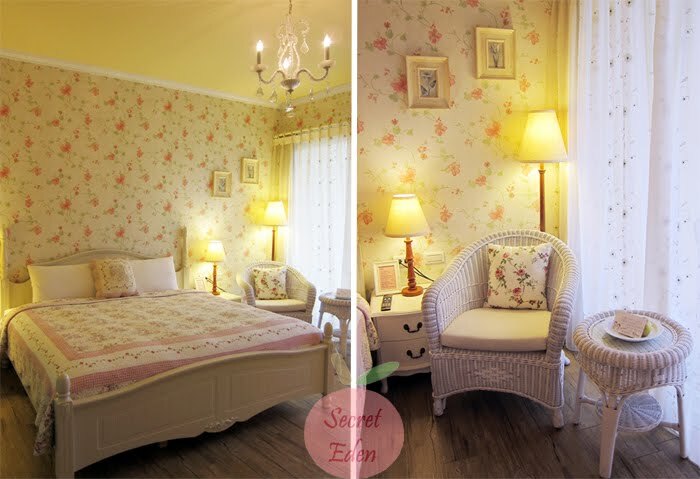 I loved their creamy flowery wall paper and the cute patch quilt bed spread. The bed was also very comfortable as well. They placed 2 apples with a nice personal greeting card on the coffee table, I certainly appreciated the personal touch. Aside from the bed, the room also had a cute dressing table with a mini fridge underneath. 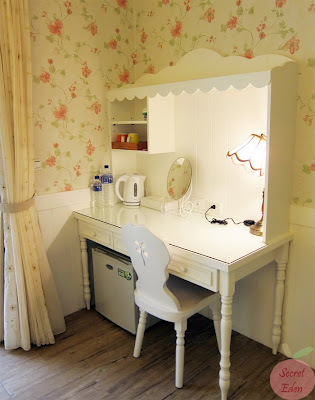 Personally I found the room very whimsical, and fairy tale like. Although they did not have a standing shower like the other B&B, but it was definitely more than sufficient. 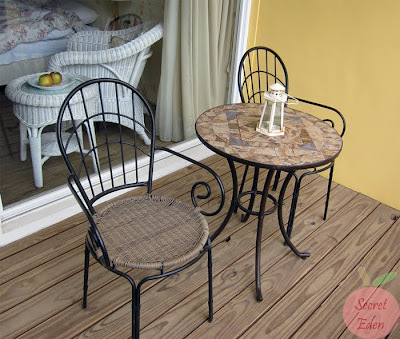 There was also a charming patio attached to the room. If only the weather was nice, I would have totally enjoy sitting here and soaking up the sun. All the patios faced this little man made lake. It was rather calming to watch the rain fall. There was also a star walk way leading to each room, then you will cross over a little bridge which leads you to the front door. This would be the dining area that is connected directly to the front desk. 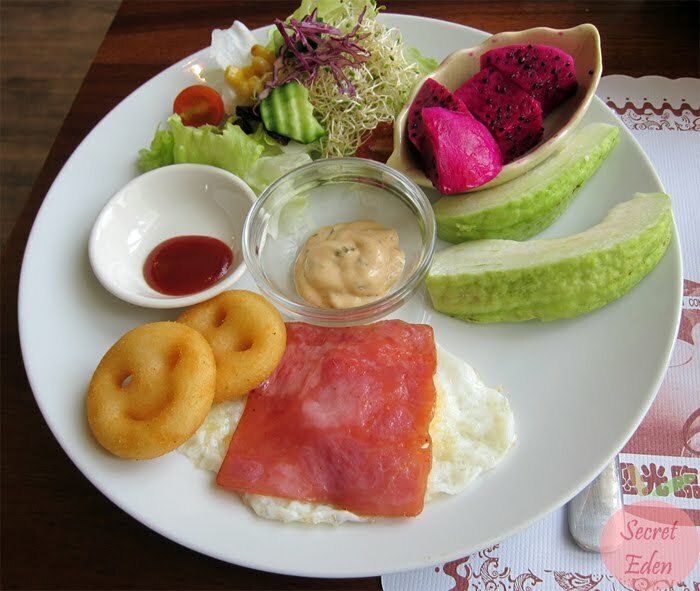 Since there is no restaurant on premises, this is mainly used for breakfast and tea. Although not as elaborate as the last B&B, they also offered us complimentary tea and dessert. I have no idea where they bought this tiramisu, but it's really delicious, I was almost tempted to ask for another. This is what we were offered for breakfast, plus some toast and a creamy corn soup. Everything was quite good, and especially the purple dragon fruit which I've never seen else where. This was actually grown on premises, and we were just lucky that they still had a few available. Although there wasn't a close by night market, but there was a downtown area with lots of things to eat. Since our main transportation was by train, the owners (a very nice couple) offered us a ride into town. They insisted that we try the above pork bun shop, and I must say I was not disappointed. Although it doesn't look all that appetizing, but both the steam pork bun and dumpling were absolutely delicious. This place is not to be missed if you are going to visit Hualian. The owners also suggested a place that serves good oyster omelet, but unfortunately it was closed on Tuesday night. Fortunately for us, we found another place that serves it and more. 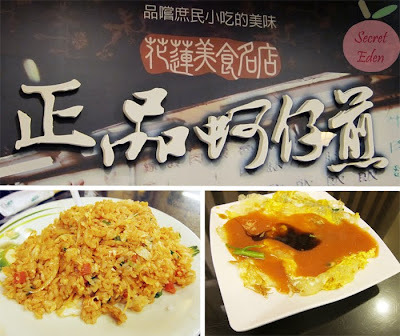 Both the ketchup fried rice and oyster omelet was very good, I highly recommend. There is one important detail I missed and that is the price. I have to say for only $2300NT ($77) a night, this place is a bargain. I also loved the couple who owns this place, they were highly personable and very friendly. 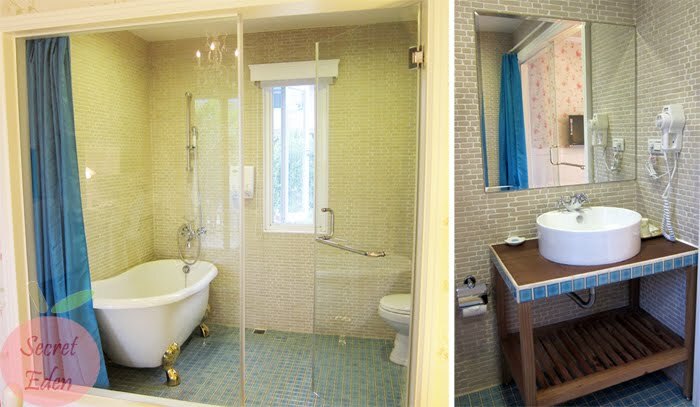 So in the end, I recommend this B&B, because it really did leave a lasting impression on me. that's a very quaint little B&B, would it be difficult to grab a taxi from there? Not at all, they can easily call you a taxi. Jenny, this B&B looks interesting. 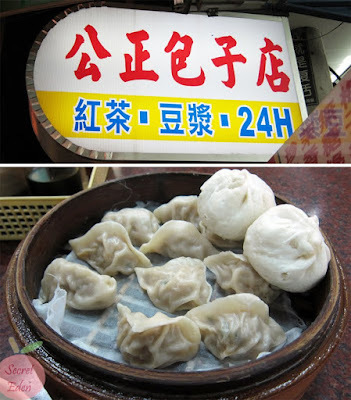 Is it a good place to base out of while touring Hualien for 4 days? How do you make reservations and deposit payment before you go? To be honest, we were there only for one day, and barely saw much of Hualien, so I am not too sure about convenience. We made the reservation through email, and wire transfer then the deposit. However, we had help from someone in TW, as they they the wire transfer on our behalf.